Michelle Benoit is a contemporary artist based in Rhode Island who utilizes translucent and toned Lucite to create minimal and enticing forms. She holds a BFA from Rhode Island College and earned her MA and MFA at the University of Iowa. Michelle’s artwork rewards extended looks and deep consideration. In the following ten questions we talk about her work, process, and more. Read our conversation and explore Michelle’s work on her website or her Instagram. Her work can be found at Memorial Sloan Kettering, the University of Iowa Museum, and in numerous private collections. She has exhibited widely and is represented by galleries in Scottsdale, Philadelphia, New York, Frankfurt, and Milan. She recently was the subject of a wonderful show at AS220 in Providence, RI and is now featured in the exhibition Object/Subject: Two Voices at Margaret Thatcher Projects in New York through October 13. Q1. Can you talk about how you get started on a piece? Do you create preliminary sketches or studies, or what other preparation is involved? A1. I purchase and occasionally collect scraps of Lucite. So the compositions have to conform to the size, shape and availability of the remnants. After we cut the components I work with the materials for a bit, stacking, looking at how the shapes receive light, and the various possibilities. From here I often sketch out ideas of what the possibilities could be once I adhere and re-cut the shapes. I respond to the material throughout the process and there is always an element of the unexpected. Q2: Your work has a feeling of precision. Do you consider your process precise or is there an element of spontaneity? A2. I have discovered that this material is entirely unforgiving. So there is a certain amount of exactness that has to happen while cutting and clamping the work, so that the piece can withstand the continued cutting in addition to retaining the applied color. I intentionally never really know what the work will look like and always respond to a work when it is uncovered from the clamps. It is on very rare occasion that the work does not need further manipulation either by additive, subtractive or both processes. Q3. Color plays an important role in your work. Can you speak more to your palate and how you select colors for your work? A3. Color is symbolic of time for me. For this exhibition Laminae, I have chosen colors from my childhood bedroom. During graduate school I had found old fabric from curtains that we had sewn when I was quite young. I also chiseled into the walls to reveal the layers of colors over the years and applied an adhesive to these things and peeled them away, the colors absorbed permanently in the glue. The color in this exhibition is extracted from that time there with my sisters and those that were there before us. Q4. Though there are clear differences, your work is reminiscent of the colorfield paintings of Mark Rothko, who you have cited as an influence. Can you discuss how Rothko or other artists have impacted your work and how you seek to change or improve upon his or other artists' ideas? A4. For me there is an extremely powerful exchange of energy when in the presence of a Rothko painting. I think to some extent there is an element of silence that allows for this reciprocity to be initiated. While I could never hope to improve on what he has accomplished, I can collect fragments of my life through color and give them a shape to see what it looks like. Q5. Your work references time, memory, spacial experience, and other topics. What, if any, advice do you have for audiences looking at your work on how to view it, and how to engage with it? A5. I have been working on a diagrammatic drawing of a personal color symbolism. It is fluid and an ongoing project which may have various iterations in future exhibitions. But for now, I can hope that something in the work would give pause, or slow time for just a moment to evoke consideration from the viewer. Q6. You exhibit widely and have international gallery representation including in New York, Frankfurt, and Milan. What advice might you give emerging makers looking to develop their own careers as exhibiting artists? A6. I highly recommend taking advantage of social media. If you are persistent you can expose your work internationally, finding your audience. I have also made great connections with other artists that I otherwise would not have. Q7: Your work tends to be more intimately scaled. Can you speak more to the size of your works and how you find the right scale? A7. Much of my work is determined by the size of the fragments that I buy. Additionally the intimacy of small scale works is always something that I am drawn to. A goal is to attempt to, catch and redirect light with these materials. To some extent I can only work to the scale of my current tools and the fragments that I buy. But I do have ideas and some sketches for larger works that I am looking forward to having a bit of time to start experimenting with these thoughts. I hope to merge the intimacy often found in small scale works to the experience that seems to happen with larger scale artwork. This may be impossible, but it is something that I am working on. Q8. You have a large following on social media including over 7,000 followers on Instagram (@michelle.benoit). Does this impact your practice or influence the way your engage with new peers, gallerists, or potential collectors? A8. I am working in the studio seven days a week do to prior commitments with galleries. Additionally we are restoring our 18th Century farmhouse while we are living in it. So I have very little free time lately. I often use Instagram to get some much needed separation from the work and also some feedback. Conversations with collectors can be very different than those with my peers. Q9: Can you share the process behind preparing for your recent show at AS220? Was all the work made specifically for this exhibition, how long have you been working on this show, and are there any other details you might like to share? A9. The AS220 opportunity came up just a few weeks before the exhibition. I had signed up to show at the Project Space about 3 or 4 years ago and remember a pretty long waiting list. My show ‘Laminae’ was happening at McKenzie Fine Arts in NYC and I was working on new pieces for my exhibition at Margaret Thatcher Projects. Because I was working under the same continued theme I combined a selection of works from each exhibition for the AS220 show. It took about a year to make all of the work for this show. Q10: What forthcoming projects are you most excited about? What's next for you? A10. Currently I am working on my solo exhibition at Morotti Arte Contemporanea, in Milan Italy for November so of course I am excited about this. I was recently invited to a group exhibition at the college of William and Mary that is part of an interdisciplinary research project with the neuroscience department. The group of artists that I will be showing with are pretty fantastic and I am just really ecstatic that a connection was made between my work and a project in neuroscience. And I am very excited about my show Object/Subject:Two Voices with Kevin Finklea at Margaret Thatcher Projects. This show runs through October 13th. You can learn more about Michelle at her website, michellebenoit.net. Abba Cudney (b. 1992) was raised in Chicago, IL and studied painting and printmaking at the New Hampshire Institute of Art in Manchester, NH. Her work is focused on the theme of the interior and she employs a subtle surreality in her depictions of spaces and objects to evoke nostalgia. Abba is one of my favorite emerging artists and in the following ten questions we talk about her process and the story behind her work. Read our conversation and be sure to stay until the end for a slideshow of some of Abba's work that I particularly like. Abba has exhibited widely including a recent show which received much praise at Kelley Stelling Contemporary in Machester, NH. She will be featured in a two person show in the Fain Gallery at Temple Habonim in Barrington, RI from March 9 - May 2, 2018. Q1. Your subject matter of choice is the interior. How do you select the spaces you depict? What's the significance of these rooms? A1. Most, if not all, of the spaces I have depicted hold some form of resonance with me. When I began on this interior journey, all of the spaces were either my first college apartment or friend's apartments. I explored everything in front of me, everything that held a memory and story. My work then evolved to a series recreating rooms of my childhood home both occupied and empty, acting as a form of therapy almost. My art changes and evolves with the passing of time, dependent on where I am and what significance that space holds for me. Q2: The significance of these spaces is evident in the strength of their execution. Is there any significance to the emptiness of these spaces? Any particular reason your rooms are not populated? A2. When figures are present in a painting, photograph, drawing, etc., a story is almost automatically formed in a viewer's mind and therefore hard to stray away from. I want the objects and spaces to act as the figures, giving them their own personalities. I want people to question why objects are where they are and to create ever-changing narratives. I like to think of my rooms as self portraits almost, with a suggestion of a presence. Q3. In your paintings, you often mix acrylic and oil. Can you talk more about your painting technique and how you developed it? A3. I found that I never liked to start on a white surface. Working off of a base of one or multiple colors helps me not only to envision a space more clearly, but also my value structure. The acrylic helps me achieve a drip-like base layer and go in without any restrictions. The oils allow me to bring the space to life with more vibrancy and texture. After my base layer of acrylics and before I go in with oils, I draw the scene and objects with charcoal. Almost 100% of the time I will leave much of the line work. I feel as though it helps enhance the feeling of impermanence, like one is looking at a fading memory. Q4. It seems like your process is pretty additive then. Have you ever experimented with erasure in your work, or removing layers rather than adding them? And what role does editing play in your work? A4. A big reason why I use charcoal when I am drawing out the scene is because of its ability to be wiped away and resurfaced again with ease. In printmaking I experiment more with the reductive process, which actually helps me more with value scale and allows me to think of my scenes differently. Q5. You cite painters as varied as Édouard Vuillard and Antonio Lopez Garcia as inspirations. What are some commonalities among artists whose work you admire, and how have they influenced your work? A5. Many of the artists I am inspired by were a part of "The Nabis" movement and some considered "Intimists", painting the everyday contemporary life. Many of their philosophies revolved around the idea of drawing emotion out of these everyday scenes and objects. I think that what connects all of the artists I draw inspiration from is their ability to take what some see as the mundane and create a more intimate story, "a window into the soul". Stylistically, I have always admired the Impressionists and their ability to use paint in a bold and vivid way that truly brings life to a painting. Q6. In addition to painting, you create monotypes and other prints extensively. How does your work as a printmaker influence your painting and vice versa? A6. Printmaking, monotypes especially, is a way for me to experiment more freely. A lot of my prints begin as the "thumbnails" for larger paintings, and then morph into their own personalities. There is an element of surprise and spontaneity in printmaking that I personally find more difficult to achieve in my paintings. Q7: In your printmaking, you often work back into the scenes with pastel or other materials. Do you feel that this additional work on your prints continues the spontaneity that the monotype process starts, or does it become more controlled? A7. I think once I go back into a print I automatically tend to become more controlled and think longer on my decisions. It also depends on what material I am using. For example, with pastels I tend to be more careful, but if I am using watercolor crayons I am more loose just due to the way the medium wants to act. Q8. 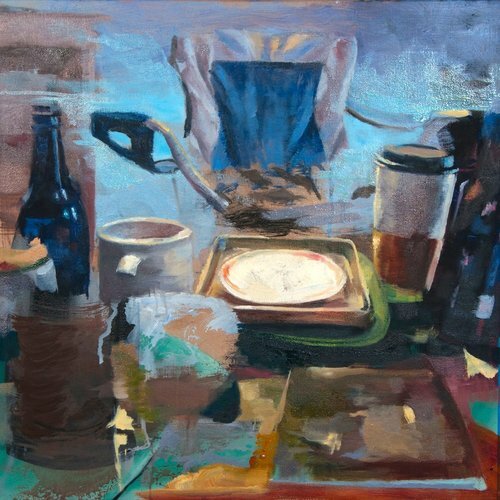 Can you talk more about the palate you use in your paintings? How do you manipulate color to influence the perception of the spaces in your work? A8. My palate usually depends on the space I am recreating and I tend to rely heavily on intuition in the beginning stages. I am very intrigued by the psychology of color and how it can symbolize emotions. In order to feel the intensity of my emotions, I exaggerate most of the colors in the objects and walls, and enhance the feeling of it being a dream or memory. Q9: You paint in a studio within your home. Does this ever pose a challenge for you? I’m thinking particularly of a great diptych of your bedroom. Does being so close to a space you’re painting make it more difficult to capture it in your style? A9. There are definitely pros and cons to having a studio in the same space you live. A few years ago I rented out a studio with other artist friends separate from my home. I miss the social aspect of that the most, being able to hear other critiques and work creatively off of each other. However, for me personally, I like being comfortable in my own space and being so close to a lot of what I paint. If I need references from life, I can just walk out of my studio and it is all there. Q10: What projects are you currently working on, and what’s next for you? A10. Recently I have been experimenting with image transfers on different surfaces and layering materials. I am continuing my paintings and prints, evolving and learning as I go. I am also in the process of preparing for a show that I have at Temple Habonim in Barrington, RI so that has been keeping me busy and driving me to create more frequently.